Well it appears news is out about the next highly anticipated palette from Urban Decay – the Electric Palette! As much as we love Naked, we’re serious color junkies at heart. When we launched The Vice Palette andsaw how CRAZY everyone went over Chaos (a brilliant matte blue), we realized our fans craved bright shades as much as us. 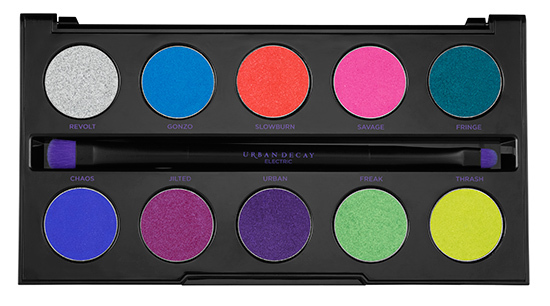 Inspired by Chaos, Urban Decay launches Electric Pressed Pigment Palette. The ultimate fix for color addicts, this gorgeous palette is packed with ten of the brightest, most amazing shades you’ve ever laid eyes on. In addition to Chaos (yes, it’s back! ), this palette marks the return of Revolt (a silver standout from our Anarchy Face Case). All the other shades are NEW! From ultrasmooth mattes to highly dimensional shimmers, each VELVETY shade delivers insane color payout. Why do a Pressed Pigment Palette? Using pressed pigments was the only way to create heavily saturated brights with the intense pigment load we craved. Traditional eyeshadow formulas just wouldn’t cut it. If you’ve tried seemingly bright shades like these before, you know that a lot of them appear brilliant in the pan, but in reality look chalky, lack smooth application and don’t look anywhere near as vibrant on your eye. Not so with Electric. We carefully crafted the formula on every shade to make sure each one would apply with a soft and creamy texture and deliver serious color payout. Wende can’t get enough of Jilted (an unbelievable bright metallic fuchsia with a blue shift). And our Product Development team is really into Fringe (a gorgeous, bright metallic teal), Urban (the most amazing bright metallic purple) and Freak (a bright green with a gold shift, inspired by our 24/7 Eye Pencil shade). The case is as cool as the shades inside. Emblazoned with “ELECTRIC,” this slim, sleek palette features a vivid, dimensional, multilayered smoke-screen print reminiscent of the shades inside. And the mirror is huge! Electric Pressed Pigment Palette also includes our NEW cruelty-free, double-ended pressed pigment brush (an all-black brush with bright purple synthetic brush fibers). On one end: a compact precision brush that’s perfect for applying color with amazing control. Use it to line, blend and smudge. On the other end: a small pigment brush. Use it to apply color all over the lid or in the crease. Every shade in our Electric Pressed Pigment Palette features our Pigment Infusion System™, the proprietary blend of ingredients that gives each shade its velvety texture, rich color, serious staying power and blendability. 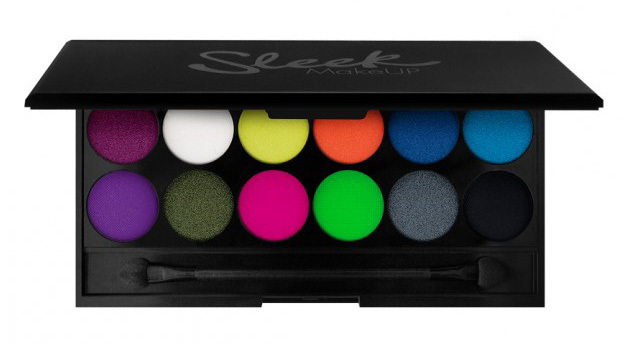 The Sleek I Divine Palette in Acid, don’t you think? Some of the colours look very similar. I’d be interested to see a proper comparison!